2017-18 SEASON: Appeared and started in 57 games with Orlando, averaging a team-high and career-high 17.8 ppg., 3.2 rpg. and 2.9 apg. in 32.2 minpg., while shooting .379 (127-335) from three-point range and .867 (150-173) from the free throw line…Ranked 17th in the NBA in free throw percentage…Led (or tied) the team in scoring 16 times, in rebounding once and in assists five times…Scored in double figures 55 times, had 20+ points a team-best 22 times and 30+ points once, including a career-high 32 points on Jan. 16 vs. Minnesota…Recorded at least one steal 34 times and had two-or-more steals nine times, including a career-high-tying five steals on Nov. 8 vs. New York…Scored his 4,000th career NBA point on Oct. 24 vs. Brooklyn…Pulled down 1,000th career NBA rebound on Mar. 3 vs. Memphis…Passed Scott Skiles (384) for tenth on the Magic’s all-time three-point field goals made list on Oct. 29 @ Charlotte…Passed Anfernee Hardaway (1,176) for tenth on the Magic’s all-time three-point field goals attempted list on Jan. 16 vs. Minnesota…Missed 25 total games due to injury: missed eight games (Dec. 8-23) due to a sprained right ankle and 17 games (Mar. 9-Apr. 11) due to a sprained left knee (MCL). PROFESSIONAL CAREER: Appeared in 376 career NBA regular season games (234 starts) with Denver and Orlando, averaging 13.1 ppg., 2.7 rpg. and 2.3 apg. in 27.2 minpg….Shot .379 (607-1,601) from three-point range and .804 (802-997) from the free throw line during his career…Also played in four career playoff outings, averaging 4.8 ppg. and 1.0 apg. in 13.3 minpg…. 2012-13: Played in 38 games (four starts) during his rookie campaign with Denver, averaging 5.3 ppg. and 1.2 apg. in 11.3 minpg., while shooting .407 (22-54) from three-point range… Led (or tied) the team in scoring once…Scored in double figures seven times, including 24 points on Apr. 14 vs. Portland…Made his NBA debut on Oct. 31 vs. Philadelphia, tallying five points and one assist in 10 minutes…Made first career NBA start on Feb. 12 @ Toronto, recording six points, one rebound and two assists in 18 minutes…DNP-CD 44 times…Appeared in four playoff games, averaging 4.8 ppg. and 1.0 apg. in 13.3 minpg….Scored 11 points during his playoff debut in Game #1 vs. Golden State on Apr. 20. CAREER TRANSACTIONS: Selected by Denver in the first round (20th overall) of the 2012 NBA Draft…Traded from Denver to Orlando in exchange for Arron Afflalo and the draft rights to Devyn Marble (Jun. 26, 2014)…Re-signed as a free agent by Orlando (Jul. 7, 2016). 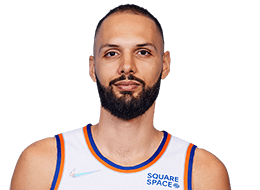 INTERNATIONAL CAREER: Played in 59 games with Union Poitiers Basket 86 of the French League…In 2011-12, averaged 14.0 ppg., 3.2 rpg., 2.2 apg. and 1.50 stlpg. in 26.0 minpg….At 19 years old, became the youngest player in French League history to score at least 20 points in a game with 21 on Feb. 5, 2011 against SLUC Nancy…Earned the French League Rising Star Award as the league’s most improved player in both 2011 and 2012...Participated in the Nike Hoop Summit in 2011…Helped France win a Bronze Medal in the Europe U20 championships in Spain in 2011. Last name is pronounced forn-yay…Born in Saint-Maurice, France…Wore #94 as a member of the Denver Nuggets to represent the country code of where he is from in France…Had a movie produced about his rise from the French League to the NBA called “Evan: Le Reve Américan (The American Dream),” which premiered in Paris on Oct. 17, 2012…Has a dog named Simba, who was named after his favorite Disney character…During the 2015 holidays, took youth from the Central Florida Boys & Girls Clubs on a Walmart shopping spree, in conjunction with Pepsi…Assisted the Magic and UnitedHealthcare staff in assembling 12,500 Hi-Five Kids Packs for Second Harvest Food Bank in spring of 2016…Active with youth in the community participating in various Magic basketball camps and clinics throughout the season…Played in NBA Africa Game in both 2017 and 2018 …If he wasn’t an NBA player, he would be an archaeologist…Fan of the NFL’s Denver Broncos…You can follow him on Twitter: @EvanFourmizz.